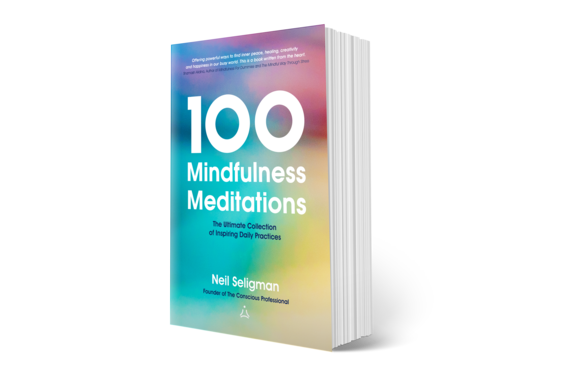 We are delighted to share the first review of Neil Seligman's new book 100 Mindfulness Meditations. This review comes from the wonderful Lynn Exley. Lynn is a Mindfulness Meditation Teacher, Mind Factor Coach, Sophrologist, yoga teacher, golfer and speaker. She is passionate about teaching simple practices and everyday ways in which people can make small changes that can have a big impact on their golf handicap and their lives. Using the evidence-based disciplines of mindfulness meditation, sophrology and positive psychology to bring balance to body and mind; increase resilience to stress; and to provide a range of tools anyone can use to cope with challenges on and off the course. Whether it's reducing your golf handicap, increasing your enjoyment of golf or your mental wellbeing, Lynn is your go-to woman. Find out more about Lynn here. Now without further ado, here's the review! I have been teaching mindfulness for 4 years and during that time I have read many books on the subject. In fact I had promised myself that I wouldn't embark on another one until I had re-read my favourites. However, when I was asked to review 100 Mindfulness Meditations by Neil Seligman it was too good an opportunity to miss so I bent the rules. I'm very glad I did. I love that. It all sounds very dramatic and exciting and it can be, but it is also the small things that happen along the way that help us to know that we are heading in the right direction and help us to stick to the path particularly when the going gets tough. I see the arrival of this book as one of those small things and I have no doubt the practices will continue to bring dormant forces alive for me and my students. 100 Mindfulness Meditations dropped onto my door mat at just the right time as my business continues to grow. It describes itself as the 'Ultimate Collection of Inspiring Daily Practices' and it is what it is, just that. I am so grateful to have received it and I am inspired by it daily! For a mindfulness teacher who, when I'm not playing or teaching mindful golf, runs drop in mindfulness and meditation sessions in rural Lincolnshire, this book is a great resource to dip into to provide the inspiration for my fortnightly gatherings in the local village hall. There is always an eclectic mix of beginners and improvers, keen to learn and to practice and sometimes apprehensive. Always thankful for an opportunity to leave all worries and cares in the car park and have an hour off from all that exhausting thinking. Collecting the cares and worries from the car park on the way out is optional! Everyone is different and every day is different for everyone so the wide variety of practices in the book ensures that there will be something for everyone and something new for every day. 100 Mindfulness Meditations looks great, it is a very attractive book which has had pride of place on my coffee table since it arrived. I love the simplicity of the format from the contents and introduction to the closing interview with the author. Life can become so complicated it is a treat to see things so clearly. Each of the practices and the pathway from beginner to advanced has been clearly laid out. Starting with a quote to inspire, followed up by an invitation to entice and a mindful tip to expand the tool kit. Then step by step instructions, not too many, practical, easily understood and simply described. A fantastic variety of authentic practices for day to day living. This bodes well for these simple practices fitting easily into every day life. As I say to my students it is much better to water a plant each day than to give it a bucket of water at the end of the month. 'Drip by drip', as the Buddha would say. So it is with mindfulness and with such a wide choice of enjoyable practices all in one place it is easy to find daily inspiration which will cultivate the necessary motivation for regular practice. Asking the question 'What do I feel like today?' tuning in, then making a choice, just like from a menu in a restaurant as intended. If you leave your seat at the table you are gently guided back each time. I shall look forward to dipping into this book often and expanding my own practice and guiding my students. I shall certainly recommend it to them and will be including the Noticing 5 Things, (practice 35), in our class practice this evening. 'Slowing down' (practice 36), is also a favourite of mine - note to self - slow down. Golf has been described as a Zen sport and I approach my game as a wonderful 4 hour mindfulness practice in beautiful peaceful surroundings, connecting with nature and fellow golfers. There is a wealth of wisdom for golfers in 100 Mindfulness Meditations, practicing mindfulness off the course can offer golfers a new perspective and a stronger mind set to take out on to the course. Of course the mind will wander but the practice of gently guiding it back to 'just this shot' has truly amazing results. The practices for 'Difficult Days' are great and, I feel, are essential practices for angry golfers to help them deal with bad shots and move on. Mindfulness is often a new concept to the golfers I meet, in fact in Lincolnshire I am still amazed that mindfulness is often a new concept for many of the people I meet. For those new to this way of seeing and being in the world the gentle touch and ease of access that 100 Mindfulness Meditations brings is very welcome. I smile to myself as I recall seeing angry signs at every turn at golf clubs across the land saying 'Avoid Slow Play at all times!' I pause and reflect 'S-l-o-w P-l-a-y' - what a lovely concept - the very essence of mindful practice. Now I know that taking 5 breaths and a body scan on the 1st tee would be impractical, but 1 deep breath and a quick head, shoulders, knees and toes with the mind, as part of the pre-shot routine, works very well. That is providing the daily practice has been put in off the course creating easy pathways for the mind to follow. For the spaces in between shots, the long walks down the fairway (or not!) most of the practices are easy to adapt, without breaching the rules of golf, and creating an expansive, creative, focused mind from which to play your best golf and live your best life. 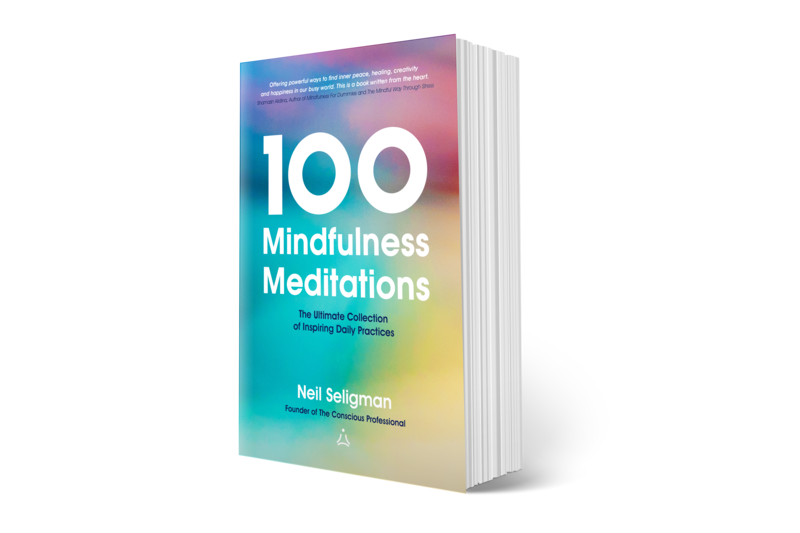 100 Mindfulness Meditations: The Ultimate Collection of Inspiring Daily Practices by Neil Seligman published by Conscious House is available on Amazon priced £12.99. 10 Mindfulness Meditations is an album of audio meditations to accompany the book and is now available on iTunes priced £7.99.